I went to ride this morning. I've had a very odd fitness routine this summer. In a typical week, here are the workouts: swimming, tennis, unicycle, swimming, tennis, elliptical, unicycle. The basic premise was that since I tend to have major injury problems when I do anything too often, I wouldn't do the same exercise on consecutive days. And I didn't, except for tennis, because I was doing that with Eli 12.0, and we were fitting that into his schedule. We played so much tennis (at such a high level of effort) that my knees started giving me problems, but everything else worked. It's the end of summer and I'm exhausted, but I'm not injured. Eli's at Camp Half-Blood this week (an all-day camp based on the Percy Jackson books), so I decided to go ride. I found a park about fifteen minutes away that had some excellent looking riding trails (on Google Maps) and went there. I parked a few blocks away from the park and thought I'd just ride there on the trails, then ride around. As soon as I started, though, I realized that I had ridden on this section of trail before. It's uphill, then it's uphill, and it's uphill for a while. Once you're on the damn unicycle, though, you don't want to step off, so I just rode. Uphill, into a strong headwind. For a mile. In billion degree weather. Once I finally made it to the park, I was gassed. So I turned around, rode a mile back to the car, then decided to drive to the park and scout possible rides. This is a new park, and it's in Texas, so it's basically miles of grass and lots of soccer fields, with a concrete riding trail. And, much to my surprise, a skate park. The skate park was, by far, the nicest thing in the park. It was big and well-designed, and while I would have loved to have ridden in it, I would have killed myself. I thought I might stay and check out the skaters, though. The only problem was that I didn't see any skaters. I did, however, see a few Big Wheels. And bikes with training wheels. 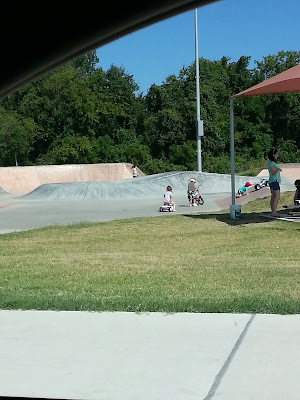 So instead of watching highly-skilled skaters do crazy tricks, I watched very small children ride their Big Wheels up little inclines and be totally happy. That's a crappy picture, I know, but I didn't want any moms to punch me.